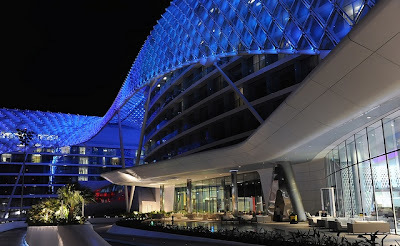 The Yas-Hotel is a 5-stars hotel on the Yas Island in Abu Dhabi. It is integrated in the race track Yas Marian Circuit where the first F1 race in Abu Dhabi took place on 1st of November 2009. The hotel, designed by Asymptote Architecture, is partly constructed over water and partly over land. 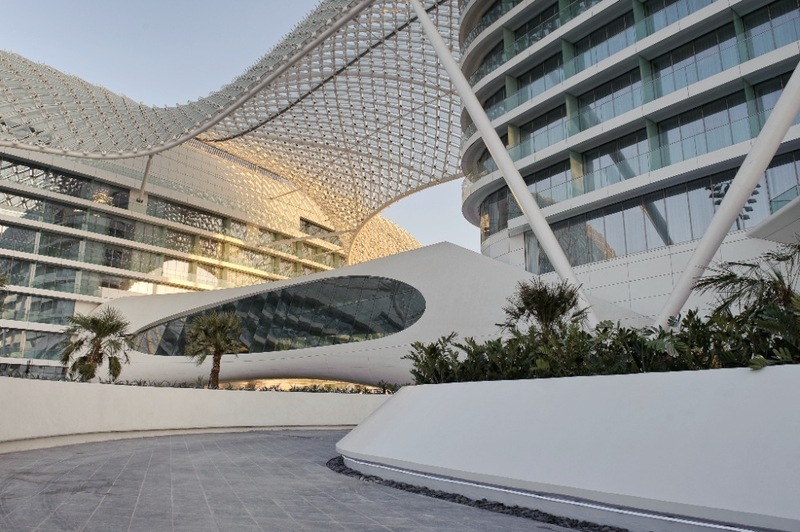 The two hotel towers, one being set within the race circuit and another placed in the Marina itself, are physically linked by a bridge. Hotel guests can watch the race from the community rooms or from the balustrades. On over 85,000 m2 the hotel has 499 rooms, 8 restaurants, conference rooms and furnished with furniture of Museum of Modern Art in New York. 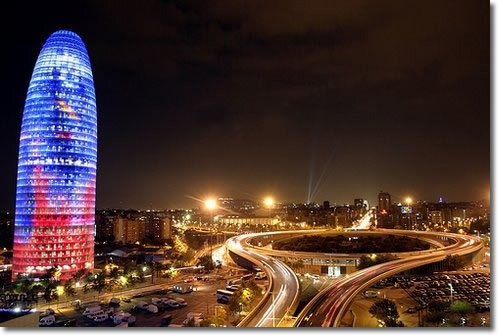 The unusal shape of the Agbar Tower was inspired by the rock outcrops of the Montserrat Mountain of Catalonia, refered to as the “holy mountain” is the work of French architech, Jean Nouvel. More than 142 meters high with over 35 stories. The whole system for drinking water of the extraordinary Spanish building has been provided with Fusiothermâ and Fusiothermâ - Faser Composite Pipe made by aquatherm. 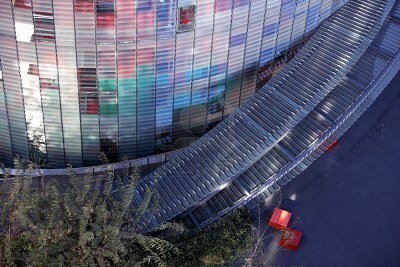 Thousands of narrow, louver glass panels enclose the reinforced steel facade of the Agbar Tower. They open outwards and provide shade. Born in 1945, Jean Nouvel is considered one of the most innovative and productive architects in the world. Graduate of the Ecole Superieure des Beaux Arts and co-founder of the French architectural movement, mars, Jean Nouvel transforms landscape into urban events in his projects. He has realised countless distinguished projects, including the Arab World Institute (1987) and the Cartier Foundation (1994) in Paris, EXPO 200 in Hanover as well as Gasometer A in Vienna (2001) and the Agbar Tower (2003). 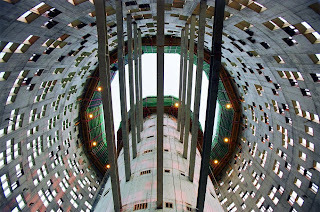 In addition, he has received many awards and prizes for his architectural works, such as the Golden Lion (Biennale Venice), the Borromini Award and the Aga Khan Price. Established in 1994, Jean Nouvel's atelier is one of the largest architectural projects in France. Over 140 personal active in diverse area are currently working on more than 40 international projects. Beside his main office in Paris, Jean Nouvel also operates from ateliers in London, Copenhagen, Minneapolis, Rome, Madrid and Barcelona. aquatherm PPR. Picture Window theme. Theme images by nickfree. Powered by Blogger.